To deal with North Korea, Trump should learn from Reagan’s approach to the Soviet Union. 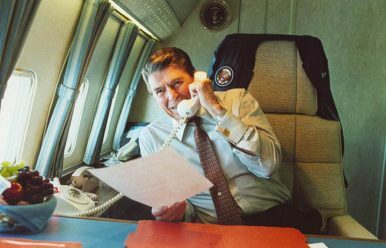 To resolve the problem of North Korea’s nuclear weapons, President Donald Trump should take a page from the book of Ronald Reagan, learning from when that president confronted a similarly fraught situation at the height of the Cold War. First, some background. The Soviet Union and its puppet East European Communist regimes wielded a massive conventional arms and manpower advantage over the combined resources of Western countries in the NATO alliance. But tactical battlefield nuclear weapons fielded by the United States, France, and Great Britain offset the Warsaw Pact’s conventional edge and achieved a rough strategic balance on the European continent. Yet, Moscow, with its aggressive designs on Western Europe, wanted not a balance of power but an imbalance that worked in its favor. So, in the 1970s, the Soviet Union began deploying medium-range theater ballistic missiles to its bases in Eastern Europe. By targeting bases in France, Germany, Italy, and other NATO countries, the Soviet SS-20s would neutralize the West’s tactical nuclear deterrent and the strategic standoff would revert to its default posture: advantage, Soviets. Having watched both Moscow’s buildup in Afghanistan and the SS-20 deployments, Carter decided he needed to show some spine on the European continent. He supported NATO’s decision to deploy comparable medium-range cruise and Pershing ballistic missiles in Western Europe. But the actual deployment would not occur for another four years, to give time for additional disarmament negotiations with the Soviets. When Reagan replaced Carter as president in 1981, he was determined to take a different approach to Moscow’s missile challenge. Mistrusting Soviet intentions in negotiations, he abandoned Carter’s policy of strategic patience and decided that, for the response to be effective, NATO’s missile deployment would need to occur sooner rather than later, starting in less than two years. Global protests that had been sporadic and relatively low-key during Carter’s administration now escalated exponentially in response to Reagan’s tough rhetoric and apparent steely resolve to actually deploy the American missiles. He was widely attacked as an irrational war-monger, recklessly playing with nuclear brinkmanship that could quickly escalate into World War III. Pacifists and Western Communists exercised critical roles in inspiring and organizing the demonstrations on American and European streets. But as more mainstream citizens joined the cause against the nuclear danger, the protests grew massively. Numbering in the hundreds of thousands, it became the largest peace movement in U.S. history, eclipsing even the Vietnam War protests. Moscow’s strategic communications campaign was working according to plan. It had preempted the West with the fait accompli of its earlier announced SS-20 deployment, portraying it as a “leveling” response to NATO’s tactical nuclear weapons. Its propagandists were able to persuade many Western citizens that U.S. deployment of the cruise and Pershing missiles was the provocation upsetting the nuclear status quo. They were helped immeasurably by the emergence of a global Nuclear Freeze movement that called for a halt to further nuclear weapons deployments. That would have stopped NATO’s missile deployments but left in place the already-deployed SS-20s. Moscow and its allies naturally loved the freeze concept. It was championed in the United States by Senators Al Gore and Edward Kennedy, along with other public officials identified with disarmament and liberal positions on national security. As the date for deployment of the cruise and Pershing missiles approached, the anti-nuclear and freeze movements focused on trying to close the bases where the weapons would be stationed. Confrontations and altercations with the police occurred in England, Germany, and Italy. Nervous American and European politicians began to have second thoughts, and several governments were on the verge of falling over the issue. Throughout the tumult, Reagan never wavered. His steadfast message to Moscow was clear: remove the SS-20s or we put in our missiles. To the protesters, the message was: direct your anti-nuclear protests at the Communist government that created the problem, not at the democracies that are trying to eliminate it. The deadlines arrived in mid-1983 and NATO’s missiles were indeed deployed. Within 18 months, Reagan and Mikhail Gorbachev, the new Soviet leader, agreed to remove all SS-20s, Pershings, and cruise missiles from Eastern and Western Europe. Four years later they signed the Intermediate-Range Nuclear Forces Treaty, calling for the complete destruction and banning of all such weapons, and broader arms control agreements were consummated in subsequent years. Fast forward to today’s nuclear confrontation with North Korea (aided and abetted by China). In East Asia, as in Eastern Europe, Communist governments control armies that vastly outnumber the forces of democratic Japan and South Korea and stationed American troops, a differential that was manifested in the Korean War. After that conflict ended in stalemate in 1953, the United States deployed tactical nuclear weapons on the Korean Peninsula to offset the North Korean and Chinese manpower advantage, just as was done in Europe. North Korean leader Kim Il-sung eventually decided that he needed nuclear weapons as well and pursued that goal until his death in 1994. His son, Kim Jong-il, and grandson, Kim Jong-un, accelerated the pace of development. Washington, Seoul, and Tokyo all opposed North Korea’s nuclear weapons program. China, rather than directly opposing its ally in Pyongyang, preferred the more generic policy of calling for the denuclearization of the Korean Peninsula. All the while, however, it supported the North’s nascent nuclear and missile programs as Chinese weapons technology found its way to Pyongyang (and other anti-Western regimes) by way of Pakistan’s A.Q. Khan network. To win Chinese cooperation in terminating the North Korean program and show U.S. good faith, Washington unilaterally withdrew its tactical nuclear weapons from the South in the early 1990s. But Pyongyang surged ahead with its own programs anyway and China did nothing to stop it. On the contrary, Beijing constantly provided diplomatic cover for North Korea at the United Nations Security Council by vetoing, threatening to veto, watering down, delaying, and failing to implement a series of economic and financial sanctions intended to curtail the program. At the same time, Beijing continued to provide its Communist ally with all the economic support it needed to hold onto power and remain as the cruelest, most totalitarian regime on Earth. China shamelessly acknowledges that it prefers this outcome to the fearful alternative of a reunified, democratic Korea (which speaks volumes about the nature of the Chinese Communist regime itself). With Beijing having its back, North Korea has had no incentive to give up its nuclear and missile programs. And with a credulous West accepting that China is incapable, or with “good” reason unwilling, to compel Pyongyang to change, Beijing has had no incentive to fundamentally change its policy. So, without the avenues of good-faith negotiations or sustained, harsh, China-supported sanctions, and short of the use of force, Washington and its allies should consider the approach Reagan employed in Eastern Europe: either North Korea gets rid of its nuclear weapons, or South Korea gets its own. The United States can accomplish that by returning its tactical nuclear weapons to South Korea, or it can support a Seoul program to develop its own. The Seoul government recently said it will not “build or own” nuclear weapons, but it was silent on the re-introduction of U.S. weapons. Deploying tactical nuclear weapons to South Korea may well mean that Japan will also want an indigenous nuclear weapons capability. All this was predictable, indeed predicted by many. It is largely China’s doing (though Moscow had a hand in it) and, like the Soviet Union facing new Western nuclear weapons on its borders in the 1980s, Beijing knows what it must do to avoid the predicament it has created. Joseph Bosco is a former China country director in the office of the secretary of defense, 2005-2006. A look at the geopolitical drivers of policy in North Korea, China, and elsewhere.